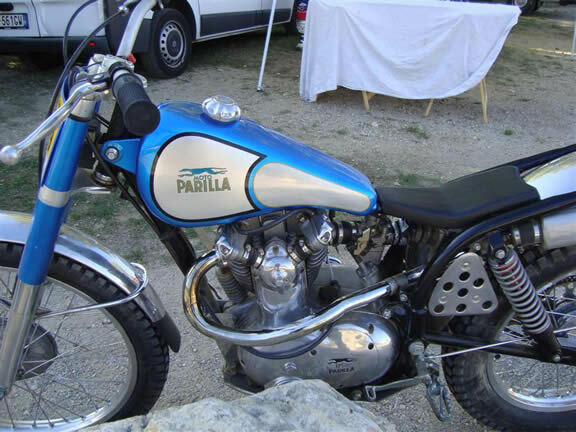 I thought I’d seen all possible uses of the revvy Moto Parilla high cam engine but a recent enquiry from France revealed an early 175 very neatly converted into a “Twin Shock” class Trials iron. No details as yet to the internal mods to the engine or quite how well such a wide & heavy engined bike fares against the current crop of lightweight Triumph Tiger Cubs. 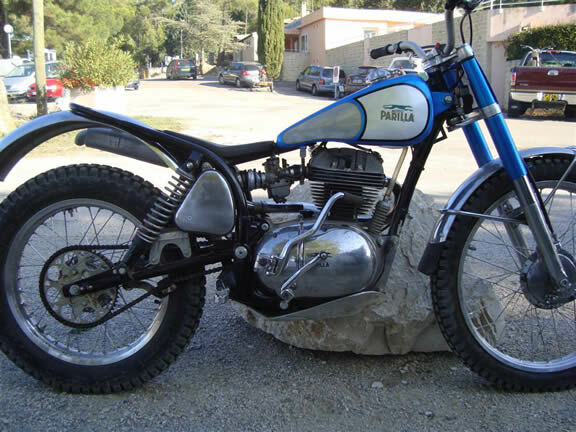 Early 175 engined trials bike – miikuni carb? Some nice touches on the bike – note the steering damper knob doing service as a gas cap! In the near future our France based enthusiast will be converting an “eBay” bought 250 Tourist parts bike into a similarly innovative mud plugger.